This is one of the most important monuments of Naxos, and, like the gate of the archaic temple of Apollo, known as Portara, a trade mark of the island. The monument is situated on the southeastern side of the island, half way between Zas, the highest mountain of Naxos, and the sea, on a hill between two ravines, Chimarros to the east and Petronia to the west. Similar towers have a wide distribution in the Aegean, but in the majority of cases only the foundations are still visible. The tower oh Chimarros is a very rare exception, standing to the impressive height of almost 15 m. It is better preserved externally, whereas internally large parts of the masonry have fallen or are about to collapse. The rare of destruction seems to have accelerated in recent years, a fact immediately discernible in photographs taken in the early 70s and in earlier descriptions: according to an archaeological report of 1923 the height of the tower was 17 m.
The tower has a circular plan; its external diameter is 9.20m. and the internal 7.12m. The walls have a thickness of 1.10m., they are made of local marble, without the use of mortar, and they are double faced. The high quality of the ancient masonry is evident. The outer face consists of rectangular blocks ranging in length between 0.35m. and 0.40m. Masons' marks are visible on some stones: Λ, V, O. The stones forming the inner face of the wall are quite irregular in size, and are chiseled only on their horizontal sides. On the south side there is a door and straight above it, 10m. from the ground, on the level of the second floor, there is a window. The only other openings are some waterspouts and loopholes, which from the outside appear as mere narrow slits, widening inside to facilitate the movements of archers. The tower was internally divided into four floors above the ground and their position can be inferred from the preserved beam holes. To the left of the entrance a staircase, with marble steps embedded in the wall, leads clockwise to the upper floors. The lower steps are missing and have obviously been removed, and from then on only those leading to the threshold of the second floor remain in place. Bearing in mind, however, the similar tower of Aghios Petros in Andros, one must assume the existence of marble steps leading to the upper floor as well. The top of the tower has fallen away, and although there is no evidence yet, some scholars assume that the roof would have been flat and probably surrounded by battlements. 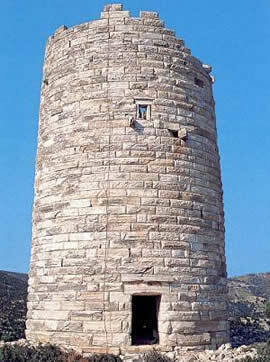 The tower stands within an almost square enclosed wall, measuring about 35m. on each side. It is better preserved in the south and most of the western and eastern sides, whereas parts of the northern side have been incorporated in later constructions. The wall is 1m. thick, reaching 2m. in height and its outer face is built with rectangular stones of various sizes. The whole of the internal and a large part of the outer face is covered by drift earth and is therefore invisible. No towers or other subsidiary buildings have been noted.